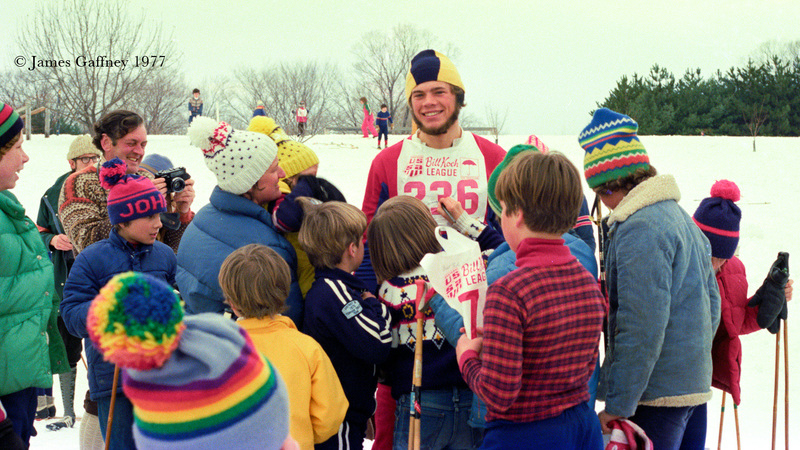 Bill Koch in 1977, just one year after he won his Olympic silver medal. Meeting skiers at an early Bill Koch Club ski race. The Berkshire Trails Bill Koch Ski Club aims to make Nordic skiing fun for kids and their families. We gather on Sunday afternoons from January through early March to learn new skills and enjoy the crisp winter weather and beautiful landscape of Notchview Reservation in Windsor, Massachusetts. Our club includes nearly 100 kids, who range in age from 5 to 14 years old. Volunteer coaches lead groups of skiers in group lessons on Notchview’s 25 miles of groomed ski trails. Young skiers begin with the basics of classic skiing. As they grow older and stronger, our skiers are challenged to try skate skiing, and some even choose to compete in regional races. Because we are a nonprofit volunteer-run organization, parents play a key role in ensuring that our skiers have the best possible experience. We ask parents to volunteer in any way they can. Some take on leadership roles as coordinators and coaches; others simply sign up to vacuum the lodge occasionally or bake brownies for special events. What’s important is that every parent do something. The Berkshire Trails Bill Koch Ski Club is one of many such clubs throughout the United States. We are named for cross-country ski racer Bill Koch, who was the first American Nordic skier to win a medal in the Olympics (he won a silver in the 30 km event in 1976). A native of Vermont, Bill Koch has been a strong supporter of youth skiing for many years, and he is often present at northeast Nordic ski events, encouraging kids to ski more—for fitness and for fun.